Highly detailed and bright large artwork as shown above on the front of the Tee only. The detailed artwork is of the C5 Generation Chevrolet Corvette Racing Flags Badge emblem with background artwork of a chequered racing flag with the large Corvette C5 script below, on a the Charcoal Tee background. 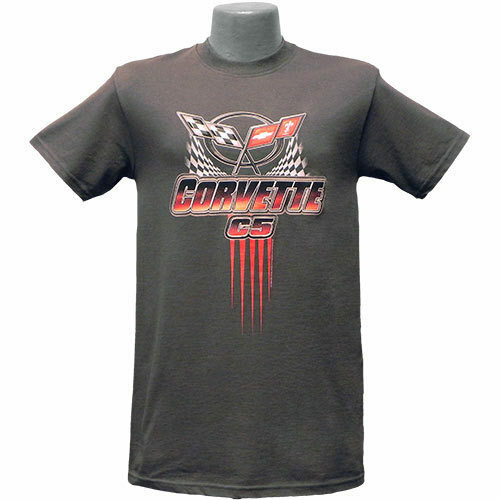 The C5 Chevrolet Corvette Racing Flags emblem artwork is quite large on the front of the Tee. Tee shirt Colour: Available in Charcoal only, and as a genuine GM official trademarked product .